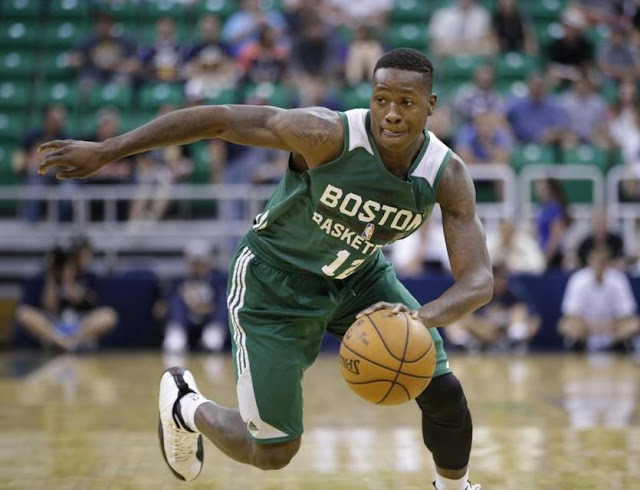 Terry Rozier only snagged two rebounds last night against the Philadelphia 76'ers, but one was a tide-turner, according to Coach Brad Stevens. With 2:18 left in the third quarter and Boston leading by only two points, it looked like Philly's 6'10" Dario Saric had great position and was about to control an offensive rebound. That wasn't going to happen, not if the tenacious 6'2" Terry Rozier was anywhere near the play. And he was, sliding in to share control of the ball with Saric. But Saric's partial control ended quickly. T-Ro won the battle for the ball, went airborne to avoid going out of bounds and got the ball to a teammate. The backcourt quartet of Kyrie Irving, Jaylen Brown, Marcus Smart and Terry is as tough as they come. The Celtics extended their lead to 76-71 by the end of the third quarter and won the game 108-97. Brad Stevens' praise of Terry's hustle play is the coach's equivalent of a Tom Heinsohn Tommy Point. Rozier certainly did not have a great game against the 76'ers, but that one play needed to be applauded. And that is exactly what Coach Stevens did. Tenacity, hard work and hustle are infectious. I watched the video on the above tweet many times. We will see many more such plays from T-Ro as the season progresses.